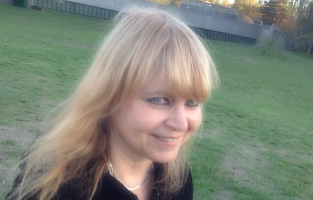 Pat Raia is a veteran journalist who covers crime, politics and animal welfare. She is also a lifelong poet. With no destination on Route 66.
is all I want to say. when the children become adults. The instruction sheet lost in the wind. like a leaf shed from a tree. 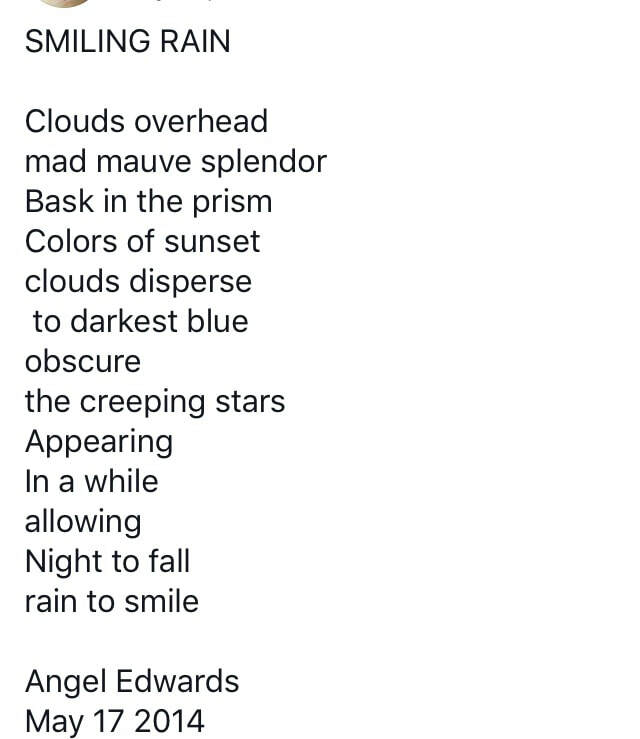 ​Angel Edwards first book of poetry "Tales In The Dreams Garden" was published by Silver Bow Publishing on July 29 2018. Since retiring from a career in pharmaceutical research and management, Beatrice Abrams, Ph.D., has exercised the more creative side of her brain. An active creative writing group and poetry writing seminar member, she writes poems as a means of exploring the world and is completing a memoir-based novel on a Jewish family’s experience in Vichy France during World War II. Beatrice participates in volunteer efforts in Hunterdon County, New Jersey, [where she resides,] and sits on the executive board of Jewish Family Service of Somerset, Hunterdon, and Warren Counties and the board of the Institute of Holocaust and Genocide Studies, Raritan Valley Community College. Her poetry has appeared in Poetry Potion. ​I was there as history moved across the stage, in the audience squirming in my seat. Scenes advanced into acts, actors read their lines, and directors waved in ever escalating change. Sather Gate shuddered and Sproul Hall quailed as smoldering hordes of students gathered in Berkeley to protest the lives they had known. I watched, I listened, I worked. Maniacal marksmen assassinated hope, crafting a cult of bellicosity. I watched, I listened, I cried. I heard a quiet voice declare a salacious strike, shoring up our dominos. Sitting at the game table I watched as chips tumbled, bombs fell, monks burned and children cried. Morality battled in streets, on busses, at lunch counters, as humans sacrificed and humanity tried to evolve. I watched, I burned, I balloted. What was I in this chain of history? I was no clasp, holding the links together but a link itself, holding tightly to myself, entwined with others, lying against a heaving breast - a small piece, not standing apart. These were times of change, discovery and renewal. Opportunity blossomed for those who could wade through odorous swamps, and I was nearby breathing in the fragrances of the times. I purified proteins and developed drugs. I peered through opaque windows into the soft and elegant offices of the elite. I etched my way deeply into those restricted spheres, never breaking through the glass. I worked, I fought, I learned, I taught. Now I sit buffeted by the present, balanced precariously on the pedestal of my past. My being isn’t measured in the world at large, but within the tiny neighborhood of my lifetime. It isn’t found speeding across multilayered interchanges. My being advances modestly on solitary bridges that connect intersecting paths to support and reinforce undulating lives that rush by. I am a speck in the edifice of existence —my shape coming into focus only in that corner of the life I share with others, building an identity brick by brick, building the world person by person. before my life came crashing down. And build a life I solely own. And still my life came crashing down. stillness swaddling a new baby. muted colors painting the horizon with hope. But how should I know these things? playing blissfully in my sleep. to clear a simple path. stagnant dreams blur the horizon. but my net, full of holes, traps only the wind. I clutch a wobbly rail and trudge toward the sun. burrowing in a burl of someone else’s creativity. Somewhere a piquant path meanders. Somehow I will trek that trail. from a place farther than before. Once I dance and I whirled in the day. Now I waltz in the light of the dark waning moon. I had time for my dreams and some play. Once I danced and I whirled in the day. 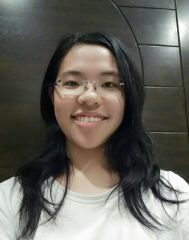 Sparkly and sweet, Samantha is based in Malaysia, and has been writing for two years. She sticks to the principle of faith, trust and pixie dust, and believes there’s magic in everyone, just waiting for the right spark to ignite it. See her other works on Instagram @writemagic99, or connect with Samantha via writemagic99@gmail.com. I look at you and wonder what you’ve seen. Have you seen horrors, crime or strife? Or have you been lucky to lead a charmed life? So I don’t quite understand what’s going on out there. What really sets us apart as a species? Are we so shallow as to look for validation here? We search for pride, for someone to revere. Abandoning dreams before they even start. Rather more so your hopes and ambitions. In milk, what rises is the cream. Prepare yourself for rocky landings. That I’ve lost what I loved most: my will. And see the ships ahoy? You’ve got your whole life laid out in front of you. And this is what will set you apart. So go, green eyes, leave this behind! You only need your heart and mind. And I’ll be with you, if only in spirit. ​I want to know you as you are, to the deepest recesses of your soul. You don’t have to mold yourself a certain way to please me. Love is a process, and we’ll learn together. I want to know your quirks, and hear your whispered ‘goodnight’ in the peace of a darkened room. Hear a symphony with me, and hear the stories told across the distances. I want to ruffle your hair during a conversation, wink with a shared secret when we pass by each other. I want to peck you on the cheek with your friends watching, and glance back to see you with your hand on your cheek, holding my kiss with stars in your eyes. I don’t need to see the flashiest shops and the latest movies. I want the thought, the sentiment. Bring me to a quiet picnic spot by a rushing waterfall, give me a flower to tuck behind my ear. Smile when I sing on a whim, and dance along spontaneously with me. When we jump off a cliff, I want to feel your hand in mine, fingers intertwined. What else would I give, to hold you close? A hundred blossoms, each a red rose. If notes were smiles, I’d play you a symphony. What else, you ask, for the touch of your hand? A hundred seashells, shining upon the sand. But none of these things, that’s for sure. Nor frequent visits to lands beyond here. But you’ll always hear the music within. Or any sort of equal hypocrisy. To cause you any grief or whimper. A lifetime of days, if you’ll have me. Lou Marin was born and raised in the western hills of Maine, then spent 20 plus years wandering the country and world in the United States Air Force. He is a photographer, published poet and short story writer who now also pens faith based devotionals. He lives in Rumford, Maine. His five poetry anthologies, published by Publish America and entitled, Awash With Words, Old Waves, New Beaches, Whisper of Waves, and Sea To Shining Sea, Version 1 and 2, are available in print and online. from miles of shimmering desert highway. in the last 200 miles. Dad can we go into the gift shop? with the "Here to Help"
and turn up air conditioning. we were tearing back up an Interstate on-ramp. kept smiles on our faces. before admitting to being tired. I was a young child. scratched out Big Band 1940's. These thoughts bring a tear. Only me and mama know why. I hope she knows I am thankful. ​Miss Eva's pipe tobacco smoke is thick in the air. The tea kettle whistles from the small kitchen. "Listen boy, here comes the six-fifteen. It always whistles at the crossing in Hartford." We sit and dream of days past. to slowly decay in a tenement thirty stories high. A tear slowly traverses the wrinkled face. "Things were better when I was a girl. I had family and friends who came to visit." into weekly visits as part of my probation. onto the narrow window ledge and to freedom. "We will free you from pain, old age, and loneliness." Miss Eva's pipe tobacco smoke is thick in the air. "Listen boy, here comes the six fifteen. in the radiator of her retirement apartment. ​It was Father's Day, I wasn't sure what to do. I just wanted to spend the day with you. and your hugs and kisses are the best gift too. a look at the fancy tetras colored baby blue. We finally picked out a few that were your wish. you helped me to make dinner, canned chicken stew. and no bad thoughts could my smile banish. A kiss and a hug when evening was through. played cards, and listened to Elvis sing. and a quiet nap under an old oak tree. Hard to see the sky with smog clouds. and have a quiet nap under an old oak tree. I went to Los Angeles on a winter day. nothing there to make me want to stay. I was scared of all the bustle and clamor. was no place for a country boy to roam. I had no liking for continuous sound. and took a quiet nap under an old oak tree.